You go on an Alaskan cruise because you want to be wowed by nature’s beauty. It sure is nice to sail with a cruise line like Celebrity that provides a plethora of extras like an at sea glass-blowing show (you heard me), a kids camp and even in-room babysitting. Incredible dining options add to the allure. Still, mother nature is the star of any Alaskan cruise, with stunning views from every angle while at sea and incredible adventures in ports. If you’re considering cruising Alaska’s Inside Passage, here’s a round-up of Celebrity Alaska cruise ports to tempt your travel palate. There are plenty of Celebrity Cruise shore excursions that focus on wildlife from which to choose in each port. But the ultimate Alaskan prize for me was a bear. My desire to see bears in the wild was what inspired my family’s Alaskan cruise in the first place. 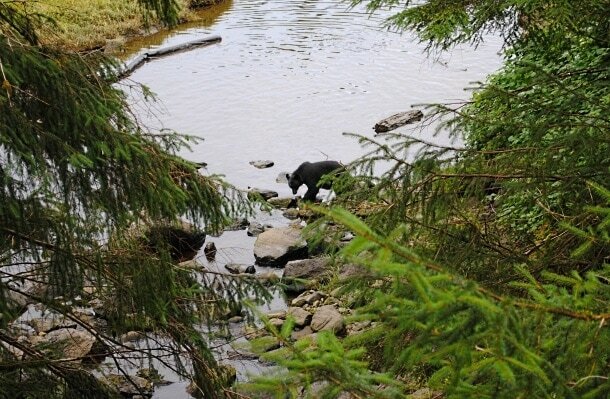 My wish to see a wild bear in Alaska came true in Ketchikan. Read more in Searching for Bears Near Ketchikan, Alaska with Celebrity Cruise Line. 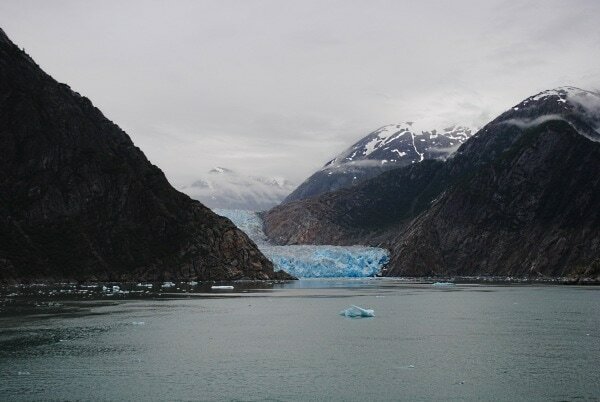 Words like, “Wow,” and “Oh my God,” will involuntarily fall from your lips when you set eyes on the Sawyer Glacier as you sail through Tracy Arm Fjord. Listed as a port, you don’t actually dock in Tracy Arm Fjord. For this portion of your cruise, the journey truly is the destination. In addition to the impressive Sawyer Glacier, you will see waterfalls trickling down giant mountains topped with snow, and water an aqua blue so beautiful, it seems unreal. Bundle up on your balcony to take in the view and snap photo after photo. If you book a room sans balcony, there are plenty of chairs and blankets available outside on the upper decks or you can sit indoors and take in the epic scenery from various vantage points aboard your Celebrity Cruise ship. A naturalist provides narration and education from a loudspeaker broadcast throughout public areas. The star attraction in Alaska’s capital city, Juneau is Mendenhall Glacier. Most excursions include a visit to this massive (yet sadly retreating) glacier. Take the Aerial Tramway to the top of Mount Roberts for expansive views of Juneau (on clear days) and hiking trails aplenty. 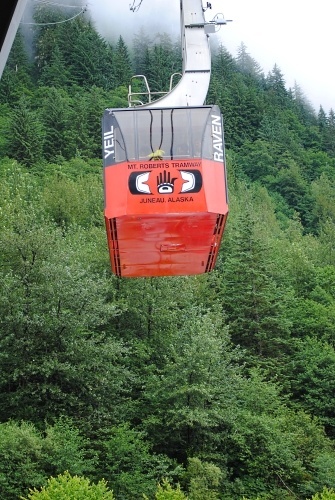 Read more about What to Do in Juneau, Alaska with Kids. My family’s favorite day during our Celebrity Alaska cruise was spent with a pack of Alaskan huskies in the port of Skagway. After this exhilarating and all-out fun adventure, we explored the picturesque town’s offerings like a darling fudge shop, wee town park, and smattering of souvenir stores. 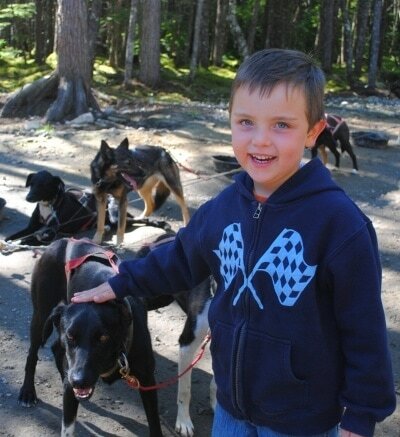 Learn more in Summer Dog-sledding in Skagway, Alaska with Kids. The renowned Butchart Gardens in Victoria, British Columbia was a must-see for this botanic garden-loving Travel Mama during our cruise. It was coupled with a fancy tea at the Fairmont Empress, making this excursion even more appealing. 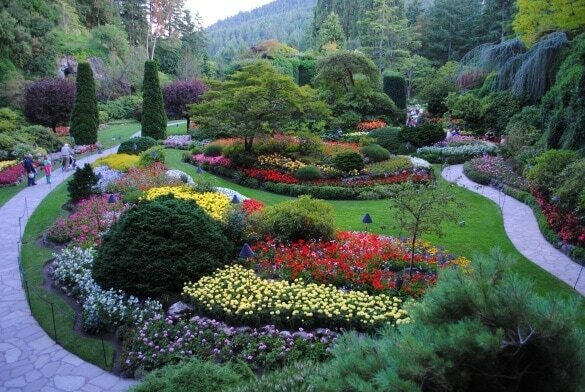 Discover the beauty of the gardens and tasty tea offerings in Victoria’s Butchart Gardens and Empress Tea – A Match Made in Girlie Heaven. Our Alaska Celebrity cruise set sail from Seattle, Washington. 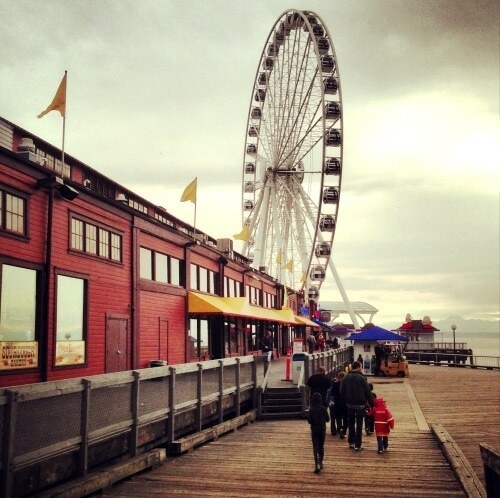 My family modeled much of what we did in the Emerald City on the advice from Seattle aficionado Allison Holm in this article, How to Spend Three Days in Seattle with Kids, and the suggestions from Lora Shinn, author of the extremely handy guidebook, Northwest Kid Trips. If you’re looking for a kid-friendly boutique hotel with fun extras located near the Seattle Waterfront, take a peek at my Hotel Monaco review. My family visited these ports of call during our 7-night cruise. Depending on which Celebrity cruise or cruisetour (land-based, add-on tour) you choose, other ports in Alaska may include: Anchorage, Denali, Fairbanks, Haines, Jasper, Sitka, Seward, Alyeska and Talkeetna. Additional ports in Canada include Banff, Calgary, Vancouver, Whistler, Lake Louise and beyond. Take a look at Celebrity Cruise Line’s sailing options now. If you’re considering booking a family cruise, be sure to read our tips for cruising with kids first! 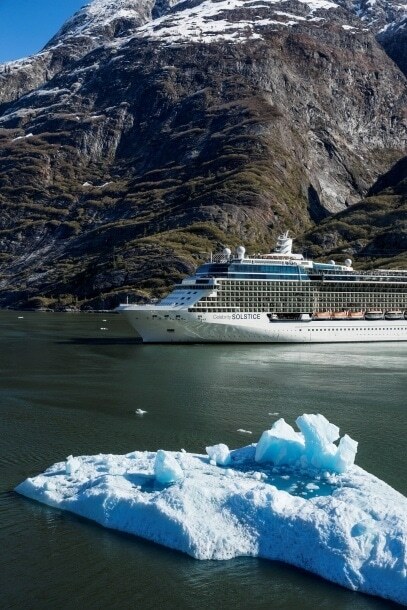 Which of these Celebrity Alaska cruise ports appeals most to you? Let us know in the comments below! A Note from The Travel Mama: Celebrity Cruises hosted my family during our Alaskan Cruise aboard Solstice. We paid for all of the shore excursions ourselves. All opinions are mine, as always. All photos by Colleen Lanin unless noted otherwise. We also stopped in Ketchikan, Juneau and Skagway on our Alaskan cruise and I loved them all but wish we would have had more time to explore Skagway. We did the White Pass Yukon train trip in that port so by the time we returned to the town it was time to get back aboard the ship. If I went on another Alaskan cruise then I would spend more time checking out Skagway! Lisa – Skagway was really cute! If I ever take another Alaskan cruise (and I hope I do), I really want to go for longer than seven nights. There’s just so much to see and explore in Alaska! We did a 5 day cruise tour following our cruise which went as far north as Fairbanks so we had a total of 12 nights. It was incredible – I highly recommend it!! Ooh…that sounds lovely! Next time…! Very nice piece and captures the beauty of this cruise. I have clients (family) doing their first Alaska (on Celebrity also) that will enjoy this review, There are some great Pre and post tours for Alaska to maximize your time there. Matt – Thank you for sharing my review of Celebrity’s Alaska Cruise ports with your clients – much appreciated! The pre and post tours looked incredible…next time!